The latest Finnish phone to hit the US stores this Spring is the Nokia 7205 Intrigue. The new phone is available only at Verizon stores, be it brick and mortar location or online. At first sight, Nokia 7205 Intrigue seeks to impress with its black exterior, hidden-until-lit external display, internal color keypad and support for multimedia and musi c features. The external display enalbes customers to text messages, play their favorite songs from V CAST Music with Rhapsody (featuring a catalog of over 5 million songs), or turn off the alarm clock. 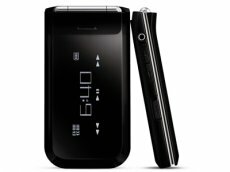 The Nokia 7205 Intrigue also has several features that promote environmental awareness. The phone comes with a built-in reminder to alert customers to unplug the charger from the wall when their phone is fully-charged, and it ships with a low no-load charger that helps save on energy use. Furthermore, it even comes packaged in Nokia’s compact packaging made from 100 percent recyclable materials. The Nokia 7205 Intrigue is available today for USD129.99 after a USD 50.00 mail-in rebate with a new two-year customer agreement. The V CAST Music with Rhapsody service is available for USD 14.99 monthly access.